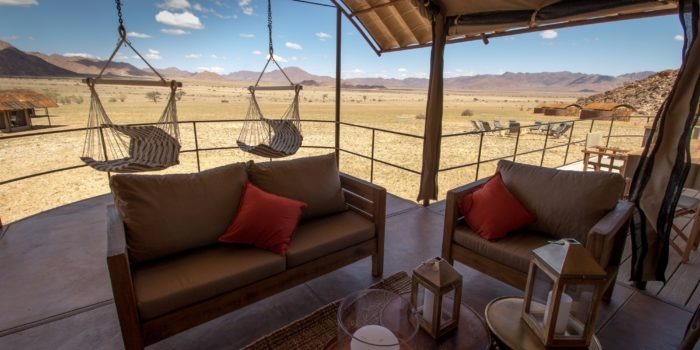 The Namib is one of the most spectacular deserts in the world, with its ochre dunes, wide grasslands and desert-adapted wildlife, it is a real pleasure for every taste. 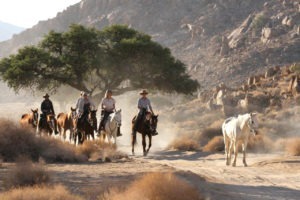 A range of mobile riding safaris are offered in different parts of Namibia. 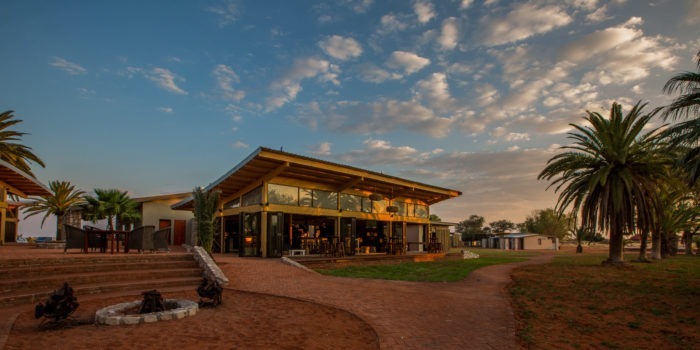 Most last from 6 to 10 days, with overnight accommodation in simple tents or under the stars of the night sky. 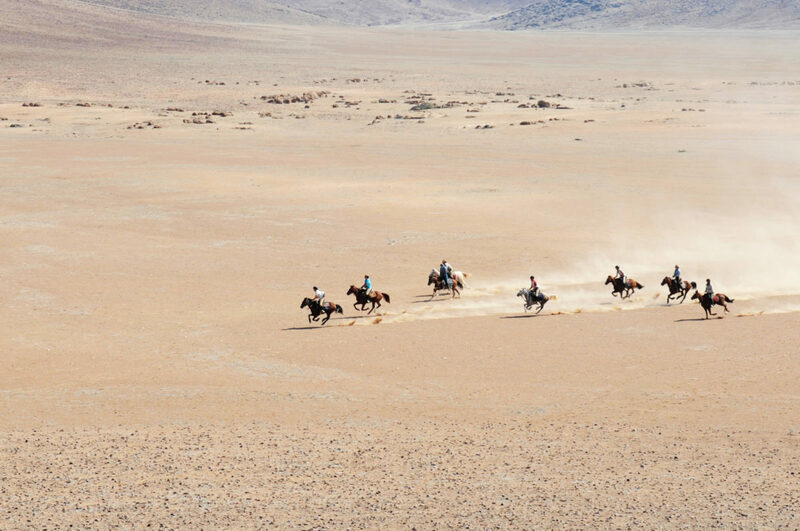 The Namib Desert Riding Safari is a 10-day journey starting near Sossusvlei and extending to Swakopmund on the Antarctic coast. It is a very challenging ride and not for the unfit or faint of heart. 20-60 kilometres are covered each day, often at a fast pace and over uneven terrain. 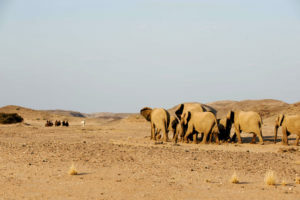 The route leads past impressive canyons, over wide grasslands and up to a final fast gallop on the beach of Swakopmund. If you are ready for this adventure, it will be the riding safari of your lifetime! 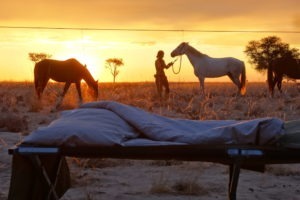 During the safari, a mobile tented camp accompanies the riders. Most guests forego their tent, preferring the special experience of sleeping out under the glorious starry sky. 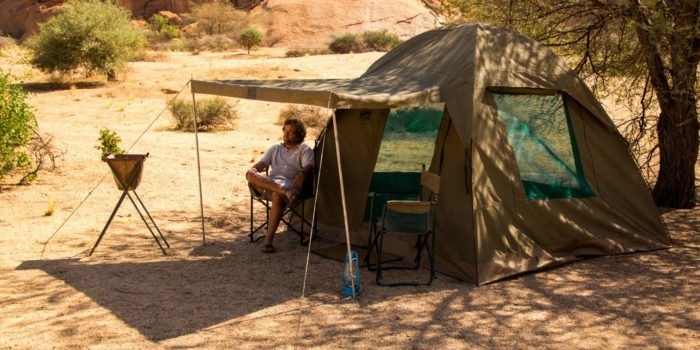 Large dome tents with camp beds and a warm linens are available at all times. There are hot bucket showers and toilets in all camps. 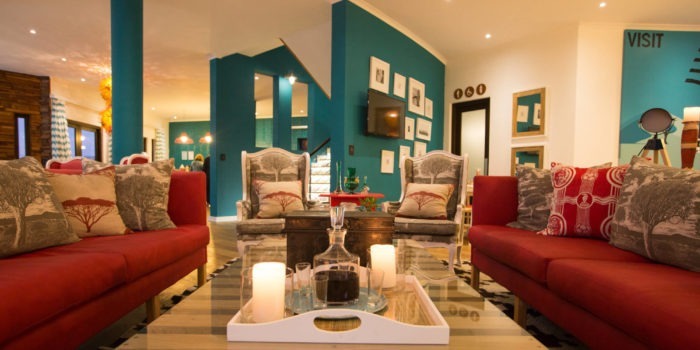 The first and last night of each trip is spent in a beautiful and comfortable lodge. 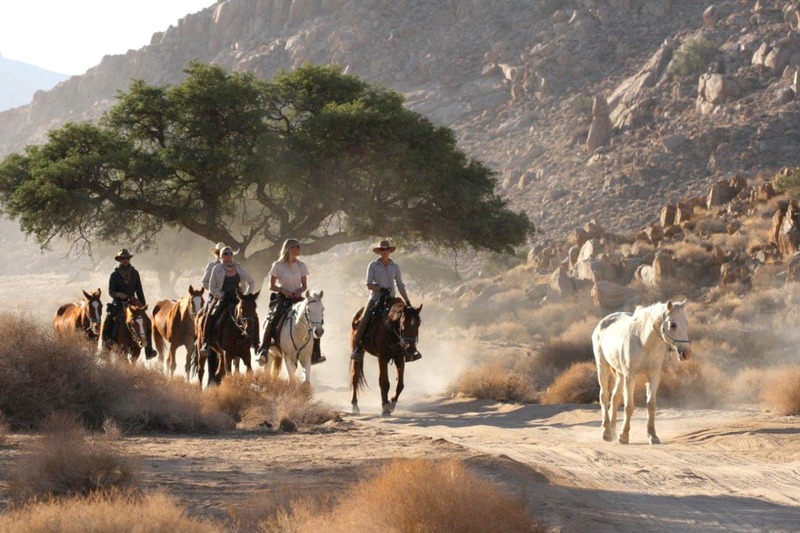 We also offer alternative riding safaris such as the Wild Horses Safari, in which horse and rider follow the trail of the famous Namib wild horses. 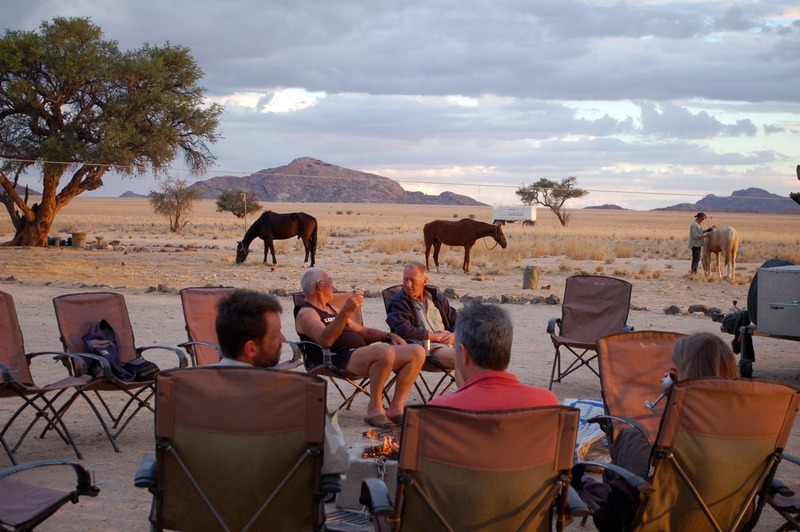 The Damara Elephant Safari, the Desert Canyon Safari or shorter, individually tailored rides offer a wonderful adventure for smaller groups or independent self-drive travellers. 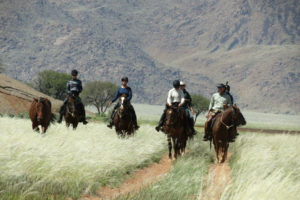 To make the most of any of the horseback adventures, riders are advised to have good health and fitness (you will certainly get fitter on the ride!). 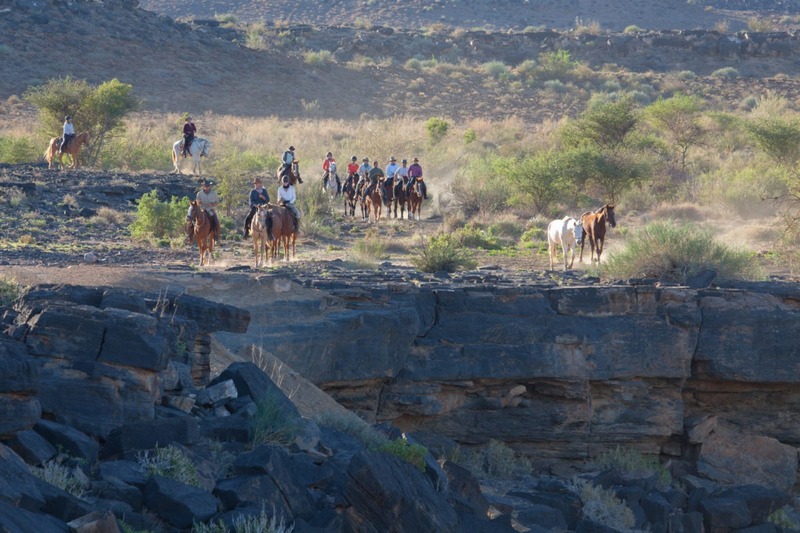 Desert riding requires good physical fitness – these rides are not recommended for inexperienced or unfit riders. The daily routes can cover 20-60 kilometres over sometimes rough terrain, at a fast pace. 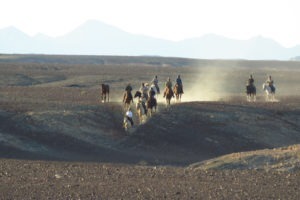 Up to 6 hours are spent in the saddle each day and long gallops are made. 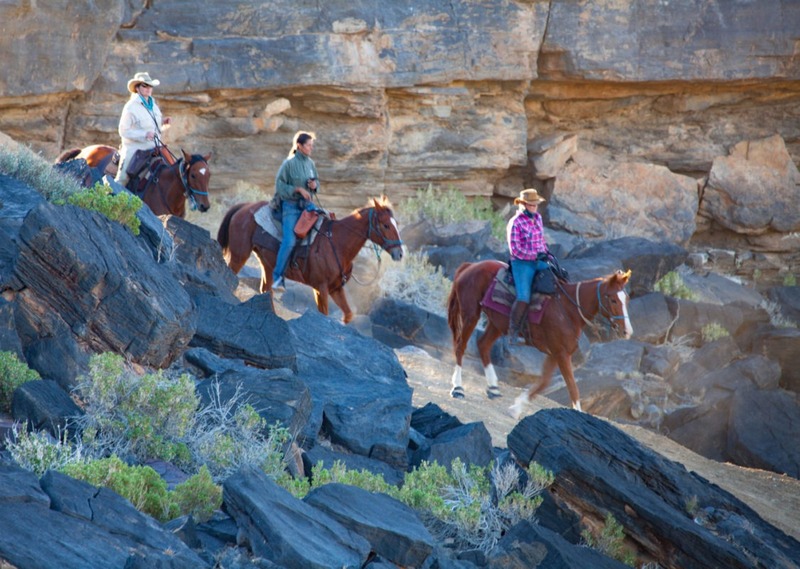 For the horse’s sake, you must be secure and balanced in the saddle and able to maintain an independent seat and kind hands at all paces. 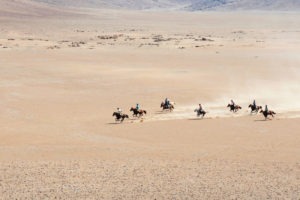 The riding adventure of a lifetime that will take you across 350 km of the spectacular Namib desert! 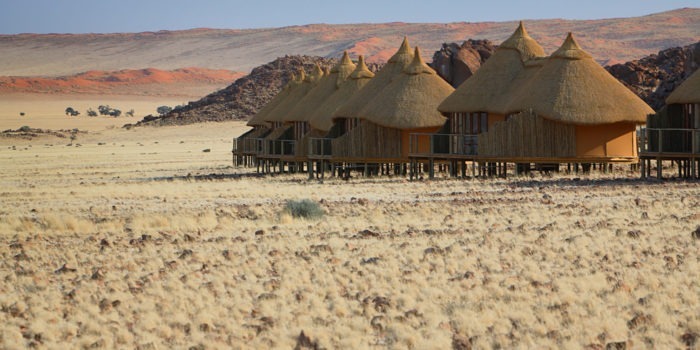 Enjoy the sense of wonder and space as you will be in some of the most remote parts of Namibia, and the planet. 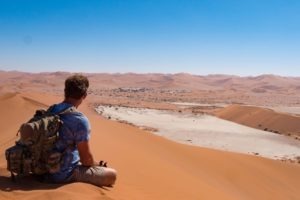 A real sense of achievement will come from the challenge and spirit of adventure found on these trips. 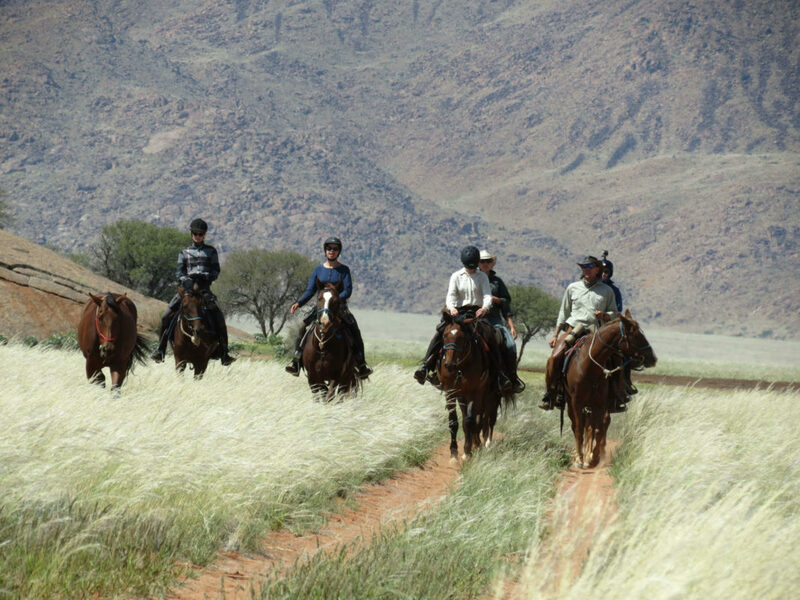 Horse rides are available in very special places such as the Namib Desert, Damaraland (Damara Elephant Safari), the Fish River Canyon or in Wolwedans (Wild Horses Safari) in the spectacular NamibRand Nature Reserve. 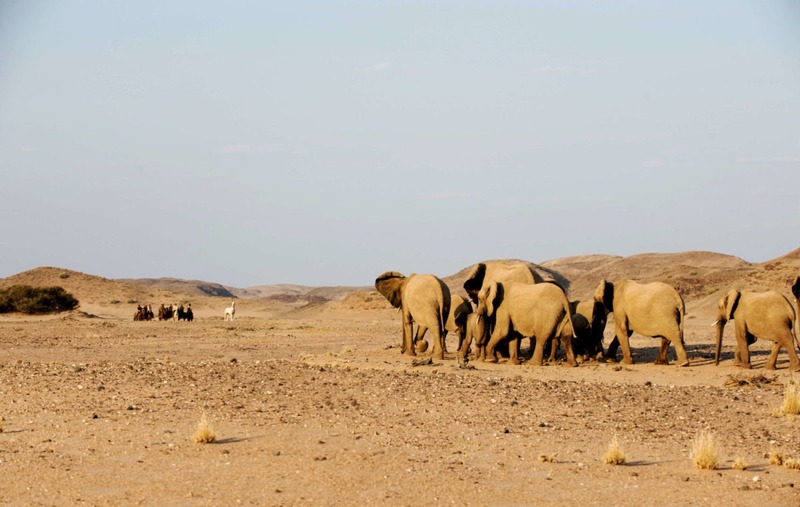 The rides lead through the beautiful scenery of rocky hills, sandy riverbeds, wide-open gravel plains and undulating sand dunes. 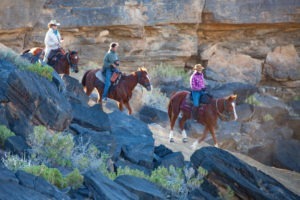 The terrain can be challenging and occasionally you may need to dismount and walk your horse over a rocky section. 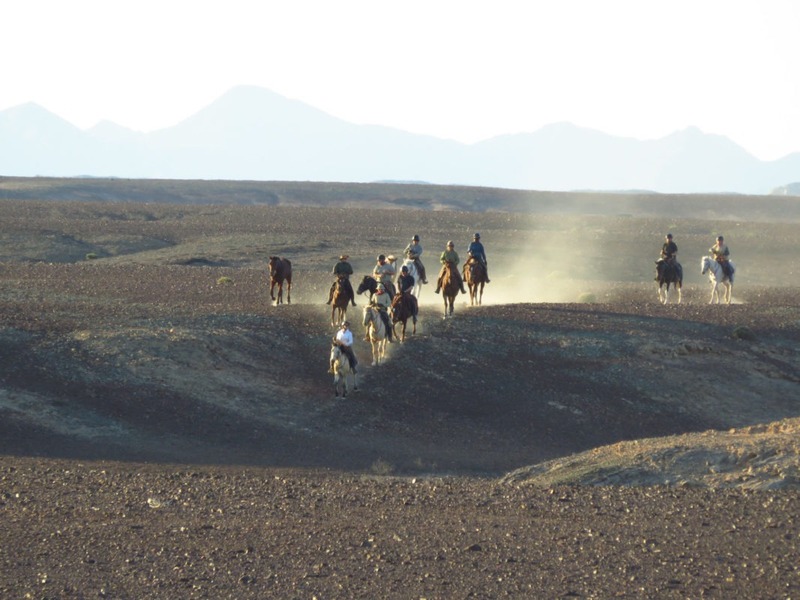 However, wide-open spaces suitable for lovely long canters abound. On the tougher rides a good sense of humour will greatly help your enjoyment. The pace set depends on the terrain, the temperatures and the fitness/weight of riders. 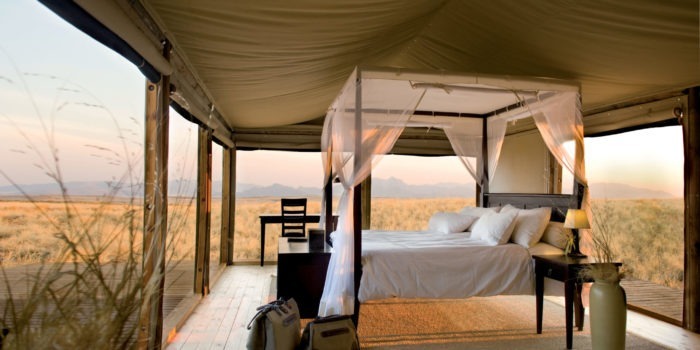 The 10-night safari costs around USD$5200 per person and include all transfers to and from the airport. 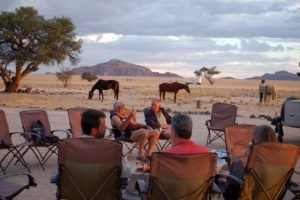 Namib short rides are available for USD 300 per person per night. 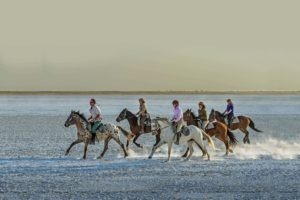 Even the most horsey person amongst you will probably have had enough for a while after these tours! 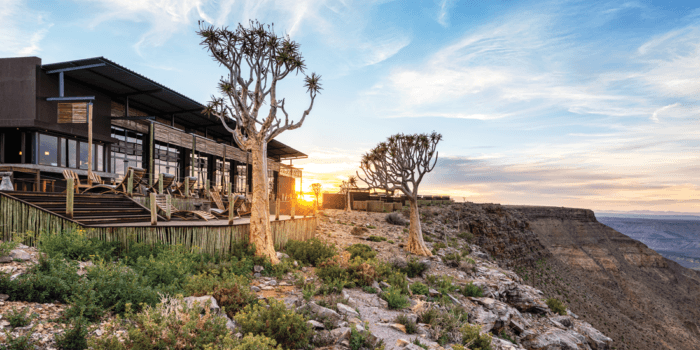 A bit of luxury and pampering at one of the fine lodges in Namibia might just be what is needed!